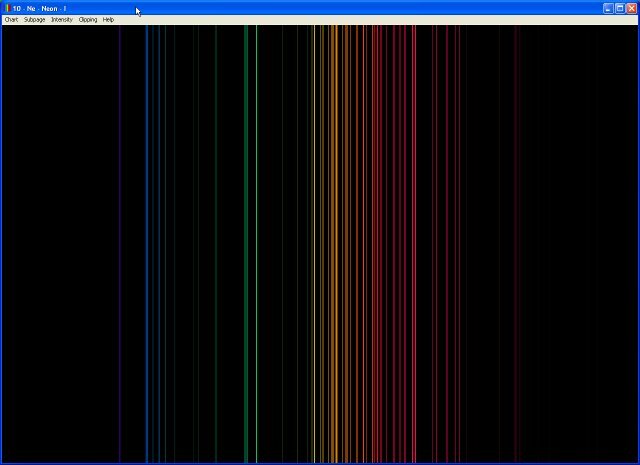 AtomicSpectra is a Windows program that draws the line spectra of the elements. Sample screen shot, for the neon spectrum. The file you will download, atomicspectraz.exe, is a self-extracting executable. Run it, and it will extract AtomicSpectra.exe, the actual application. AtomicSpectra has been tested on Windows 95, Windows 2000 and Windows XP. It will probably work on other versions of Windows (98, ME) but I haven't tested it. The neutral lines (labeled as I) for all elements from hydrogen (1) through einsteinium (99) are shown, although a few do not have any known lines in the visible light range. Spectral lines for ionized atoms (II, III and so on) are not shown. Chart - The up and down arrow keys scroll through the elements. Control-up jumps to hydrogen (the first element). Control-down jumps to einsteinium (the last element). Subpage - The grayed out subpage commands have no effect on the spectra. Intensity - The plus and minus keys on the keypad increase and decrease the intensity of the display. Control-plus and Control-minus apply 10 steps of intensity increase or decrease. The A or Z keys reset the intensity to its original value. Clipping - You can select among two different methods for drawing colors outside of the range of the computer monitor. See the Color Clipping section for details. Help - The F1 key displays the help text. You can also open an information box about this program and the spectra data. Clicking the mouse on a spectral line will open a dialog that shows some information about the line: The wavelength(s) (note that sometimes several distinct lines fall onto the same column on the screen) and the color of the spectral line. The lines are pretty thin, so you have to position the mouse accurately to select the lines, instead of the black background. The color is printed both as the actual rgb values used to draw the line, as well as the attempted color that AtomicSpectra would like to have used. These are usually different for the reasons mentioned in the Color Clipping section. The attempted color is shown both as rgb values, and also as CIE XYZ color values. The CIE XYZ color system is a standard device-independent color system. The colors of pure spectral lines (only one wavelength) are too saturated (too pure in color) to be displayed correctly on the display. This is why the attempted color that AtomicSpectra wants to draw usually has a negative value for one of the red, green or blue values. The computer cannot display negative color values, so the desired color must be clipped to some color that does not have negative values. There are two available methods for doing this, and these can be selected from the Clipping menu. Neither of these methods can claim to be exactly correct, they are approximations forced by the limitations of the computer display. Add White (the default) will add white to the desired color (de-saturating it) until it has no negative components. At the same time, the color values are rescaled so that the largest red, green or blue component is unchanged. Clamp to Zero will treat any negative components as zero. It is also possible that the desired color is too bright to be displayed on the monitor. In this case, the rgb color values are scaled down until they are displayable. Line Spectra of the Elements, Reader J., Corliss Ch.H., 1980-1981. CRC Handbook of Chemistry and Physics, NSRDS-NBS 68. This source notes that the tabulated intensity of the spectral lines is arbitrary. AtomicSpectra arbitrarily assumes that the listed intensity is proportional to the power emitted. http://www.fourmilab.ch/documents/specrend/ - Colour Rendering of Spectra, John Walker. An explanation of the process of calculating rgb values for spectra, as well as the CIE XYZ color values. http://physics.nist.gov/PhysRefData/ASD/index.html - NIST Atomic Spectra Database. Another source of spectral line data. http://amods.kaeri.re.kr/spect/SPECT.html - AMODS: Atomic Spectral Lines. Another source of spectral line data. http://adc.gsfc.nasa.gov/ - Astronomical Data Center at NASA Goddard Space Flight Center. My original source for the CRC spectral line data. The ADC has been discontinued, their link now suggests alternate sources for information.